Live music can be used at a variety of occasions or on your special day. The ceremony, pre-dinner drinks reception and dinner are all prime opportunities to include music to help make your day extra special. Fiana is available to play for any or all sections of your day and would be happy to discuss or offer advice on music choices. If there are music requests that are not already part of her repertoire, she would, of course, be very willing to acquaint herself with them. 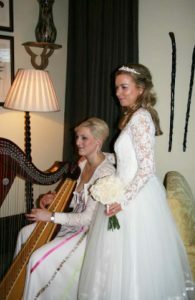 If there are specific requests that are not harp pieces, Fiana can arrange the music to suit the occasion where appropriate. As an experienced musician, Fiana is accustomed to collaboration with other musicians. These may be musicians you have arranged yourself, or alternatively Fiana can make recommendations based on your specific requirements. “Fiana filled Dublin City Hall with the most magic of music on our wedding ceremony.